The Pima County Sheriff's Department SWAT team that gunned down a former Marine in his Tucson home during a raid in which no drugs were found was cleared Tuesday of any wrongdoing in the incident. The victim, Jose Guerena, 26, died in a hail of bullets in his underwear in a hallway of his home as he responded gun in hand to his wife's report of armed intruders. SWAT team members coming through his front door fired at least 70 rounds at Guerena, striking him at least 21 times. Guerena never fired a shot. The SWAT team prevented emergency medical teams from treating him for more than an hour. He was pronounced dead shortly thereafter at a local hospital. Pima County Chief Criminal Deputy Attorney David Berkman said in a report issued Tuesday that the SWAT team members were justified in using deadly force because Guerena pointed his weapon at them. "A close examination of the rifle revealed it appeared to have been damaged by being fired upon from such an angle that it must have been pointed toward officers," Berkman wrote. "The officers were mistaken in believing Mr. Guerena fired at them. However, when Mr. Guerena raised the AR-15 semi-automatic assault rifle in their direction, they needed to take immediate action to stop the deadly threat against them." The report did not delve into how the SWAT team could mistakenly think it was being shot at, nor did it address the fact that no one has been arrested in the series of raids that took place the day Guerena was killed. Police found weapons and body armor in the ex-Marine's home, but those are legal items. The report also did not note the role that the choice to use SWAT when entering the home played in creating the situation. In statements to investigators after the raid, SWAT team members said the raid on Guerena's home was part of a probe into "possible drug running, home invasions, and potential homicides." But the only actual -- as opposed to potential -- killing has now been ruled not a homicide. Jose Guerena died at the intersection of Second Amendment rights and paramilitary policing. He isn't the first, and he certainly won't be the last. I can't belive people are just sitting by and letting these raids continue. It's a disgrace to allow law enforcement to break down the doors of American citizens looking for small amounts of drugs or anything else they can find. This is not what SWAT was started for. To think that America allows law enforcement to invade our homes, shoot our dogs and their owners, is a clear sign of just how far the drug war has corrupted this country. Any president who allows this to continue is a traitor to his country. The war on some drugs is destroying this country. It's sad to say but I believer there is no Tyranny that will force the people to rise up. These no-knock drug raid murders are happening at an increasing rate. Even if there are not deaths, the Militarized Police Forces should not be allowed to terrorize anyone. There is no Constitutional Authority for no-know warrants. The DEA belongs in russia not America , there mentality has no place in a supposedly free society , one day they will walk into a claymore~chill~pill . We impeached the DEA founder so why not them as well . No surprise here - but what are the consequences? Of course all the killers did nothing wrong - they followed protocol and so what if they killed somebody and nothing illegal or suspicious was found to even back up their weak excuses? These SWAT people are our security forces - thank God we are all safer now! All those in Tucson and throughout the USA can rest securely in their homes knowing that these incompetent bloodthirsty killers are running the streets, breaking down random doors and shooting up everything in sight - without provocation or cause - knowing all the while that they will be found blameless and their SWAT superiors will never prosecute them and in fact, will make all the necessary excuses so they can continue to play "Kill the Citizens". The net result of course, is that homeowners who are confronted by ANY ARMED STRANGER - UNIFORMED OR NOT, will assume they are dead anyway and shoot first. The reasoning will be something like, "Why not as I'm a dead man (or woman) anyway and maybe I can take some of these clowns with me." Maybe it is time to demilitarize our police forces and have them move back into a primary function of maintaining the peace? Or is that idea just way too radical? I really don't like what has happened to MY ATTITUDE after some 30 years of this. It's hard not to hate cops reflexively, though I know that is irrational -- since at least 5-10% of them are probably decent people who actually do want to defend the Constitution. The other 90-95%? They would LOVE martial law to be imposed, you can bet on it. Yippee! No more Mirandizing people, no more getting warrants! They would freakin' love it -- sorry, sweeping generalization again. I mean, 90-95% of them would love it! Holy Smokes. It is now unsafe to protect yourself and your family at home. Did the LEA do a preliminary investigation beyond the "informant?" These types of military police actions against the citizens of United States must have James Madison and Tommy Jefferson rolling over in their graves. What happened to the America I once knew and loved? Everyone should go to the local paper's website and submit a letter to the editor expressing outrage about this whole situation. Another good option is go to the police department's website and contact them via their email address to express outrage. I have already done the latter but not the former. I am planning on doing so, however. so from what i read seems like best action to take is to lay down a line of fire if some one breaks down your door .let a jury make the descion who was right or wrong in stead of killers who do home invasions .either way you could end up dead so i guess best thing a american could do is keep 2 sks with 40 round clips next to your bed wich should give any crimnals a problem to work with .i dont understand why people would not automaticaly shoot at any body kicking down your door if you have not been involved in any crime you can assume its just thieves .ill take my chances with a jury . He was shot because he went to defend his home with a gun? If the cops bust in a door, they have to expect to be greeted with a gun. For them to kill this man is outrageous and not excusable. How can no one have to answer for this. The person that ordered or approved this entry should have to answer for this. I can tell you, if ANYONE busts into my house, I will shoot first thanks to this article. I may be taken out just like this poor soul, but I wont be the only one shot so that they wont be so ready to do this again. 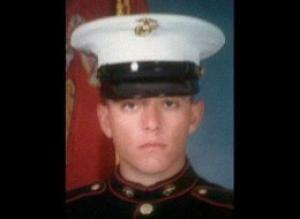 This young man should have stayed in the Marines where he at least had a fighting chance to save his live. Another example of our government going terrible wrong in the name of protecting ourselves from ourselves. These SWAT people should be renamed as Americas new "SS Troops". How can any reasonable person justify a police action such as this? The police call it a "probe" and the citizens that pay them would call it "breaking and entering". If the tables were turned, Mr. Guerena I am sure would be in jail and facing murder. A nice standard taxpayers against the "chosen few". "...when Mr. Guerena raised the AR-15 semi-automatic assault rifle in their direction, they needed to take immediate action to stop the deadly threat against them." But the ten guys in his doorway pointing automatic carbines in his direction pose a "deadly threat"? They can just hose down a citizen, let alone a decorated war hero, because they FEEL threatened? These guys are not soldiers and Jose Guerena is not an enemy combatant. He was an American citizen who's rights were violated when he was MURDERED without ever commiting a crime. Masked men commit home invasion . Murder homeowner. Make accusation of the dead with no evidence. Death squad acquitted again. Another in a seemingly infinite case of "Justice" being "properly served." Even a modicum of power can be leveraged so that you'll never have to face the consequences of your actions when employed by the state. "The SWAT team prevented emergency medical teams from treating him for more than an hour. He was pronounced dead shortly thereafter at a local hospital." So he laid there....a former soldier who protected those same mens freedoms...and bled to death. SWAT should be ashamed of who they are. Stop the drug war, dismantle the Federal organizations. The incident shows that the SWAT teams and such are trained to "go in" expecting to be met by an armed, drug crazed felon. What makes it worse the weapons they use are automatic weapons set on full automatic. I dare anyone to "get off" just one round; especially, when in a highly charged confrontation. Police need to adopt a more reasonable modus operandi. If I were a close friend or relative of this veteran, I would file a "wrongful death" lawsuit and ask the local chapter of the ACLU, the same organization which helped the GOP propagandist Rush Limbaugh. Don't let these people get away with "legal" murder. Sue the tarnation out of them. Yeah, that war on drugs we've been waging for the last forty years has been real productive. What is very disturbing to me is the trend I've seen change in those last forty years. Police today are no longer benevolent first-responders. As our laws become harsher, attitudes of police tend to reflect the lower-end of society they deal with. And subsequently they treat everyone like a potential felon. (And members of my family have been in lawenforcement for the last seventy-five years!) I have seen their attitudes change with the times. Society continues to sink lower and lower. Yet, it doesn't seem to bother some people. It's accepted as the new norm. The Holder Justice Department has taken up the case of a muslim teacher who lost her court case, demanding time off during the school period to go on the hajj. Let's see if he takes up this case for civil rights violations. I won't hold my breath. What has this world come to, when you are not safe in your home, nor are you safe to defend it. This shoot first, ask questions later policy, has been proven to take innocent lives, whether they be a human life, or an innocent animal's life. It is still a LIFE nonetheless! Why does the police department find it necessary to conduct themselves like blood thirsty terrorists. I feel there is no real reason to invade a home in this manner. I have seen other invasions go terribly wrong as well, and innocent lives lost. No person held accountable, and the whole incident swept under the carpet like it never transpired. This kind of behavior is unacceptable, but continues to happen, while this insane protocol is treated as the norm. While innocent people die, these brainwashed monsters laugh all the way to the bank, cashing their overtime paychecks! What a heartbreaking tragedy, to gun down, "IN COLD BLOOD" a man who served his country, and was only protecting his family. This is a disgrace to this country, and our Constitutional Rights! http://www.leap.cc/ The above linked organization was started for EXACTLY these reasons right here. What is wrong with these people? They need to go back to school and learn to read, write and count. Why do they keep getting the wrong address? You can be sure that whatever they do that is wrong, even killing someone, they will LIE. LIE, LIE to cover their asses. They are deceitful with no backbone or character. Why don't they admit their errors? Oh yes! see previous statement. They've been watching too much TV and most of them are wannabee's - never done anything substantial in their lives. There are two things acutely wrong with the shooting of this young Marine. (1) are the police so stupid that their investigation could get the wrong house. I think this was definitely premeditated,murder. Why? This young man was an ex-marine, they knew that. This was more like a hit squad. (2) They have never said unless I missed it that they had a warrant. They had to shoot this poor young man 70 times. Why? Were they so scared all 20-30 of them that it was necessary. The city and police should be indicted for murder and the city should pay the window a large settlement for the killing of an innocent man. In conclusion, if we do not get some backbone in this country by pushing back legally to start ,our 2,and 4th amendment rights will be gone. These incidents are not intermittent. They are happening all over the country. The target seems to be people the government thinks will be future trouble makers. Calling all Veterans, how long are we going to put up with the killing of our brothers and fellow citizens of this great country?